My FAVORITE cutting board! I’ve been using Epicurean boards in my cooking classes as well as at home for the past 9 years. Cutting Boards are one of the most important and frequently used tools in the kitchen. The RIGHT board is essential for your safety and the care of your knife. 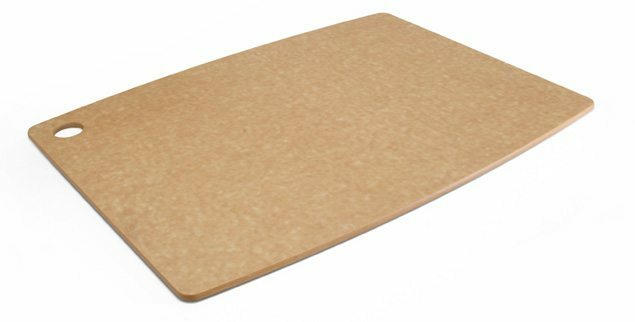 These lightweight but sturdy cutting boards are designed for everyday use and effortless handling. Their thin profile and built-in utility hole make them easy to store in a rack or display on the wall. Available in multiple sizes, these versatile cutting boards are perfect for the busy kitchen. Whether you use one at a time or several at once, cleanup is easy – just place in the dishwasher with the rest of the dishes. Quick. Convenient. Sanitary. No kitchen is complete without at least one! 17.5" x 13", 14.5" x 11, 11.5" x 9", 6"x8"